We Discover Canada And Beyond: Saskatchewan's Scotty, the T-Rex Dinosaur and Grasslands National Park. Saskatchewan's Scotty, the T-Rex Dinosaur and Grasslands National Park. our target, "The T.rex Discovery Centre" located in the community of Eastend, SK. Eastend is famous for the 1991 discovery of a nearly complete Tyrannosaurus Rex or what we more commonly call a T-Rex. He or more then likely a she, was named Scotty. The main focus of the centre is to increase awareness of the very rich and diverse but often overlooked, fossil resources of southwest Saskatchewan. The centre is home to a state of the art Fossil Research Station, and interpretive gallery and a collection of touchable fossils. Everyone should go, it's a blast. Remember "Coprolite Happens"
From Eastend we headed to Grasslands National Park, close to the Monatana border in the SW of Saskatchewan. 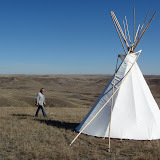 The Grasslands National Park is a wonderful "true" nature park, it is the way the prairies used to be before Europeans set foot here. If you are lucky, you will see bison raising dust, swift fox pups playing in a coulee, the rare short horned lizzard, ferruginous hawks, a creek finding its way along an ancient glacial valley and much more. Hike and find the time-worne ring of stones on a windy ridge. These rings of stones were used to hold down the tipi (tents) of the native indians so the wind would not blow it away. Many of the native tribes; Gros Ventre, Assiniboine, Cree and Blackfoot hunted bisons and deer here. Even Sitting Bull camped here briefly as he fled the USA after the Battle of the Little Bighorn. There are lots of hikes you can do and a primitive but wonderful campground "Belza Place" overlooking the valley. There is a new campground being built. Talking to the park office, there is no word on when it will be finished but, we think you will be able to stay there for the 2011 season. I think I would prefer the old one though. The only thing available at the Belza Place campground is a dry toilet, so come prepared (that means at least 2L of water per day per person). A word of caution, the Bisons are wild and unpredicable, do not go close. Also while hiking or just walking around, be aware of Rattlesnakes. They live here, but will only strike when thretened or cornered. This is a good reason to buy a pair of cowboy boots. We did the Eco-tour with our own vehical through the park, it was great and we can highly recomend it. There is a visitor centre (1-306-298-2257) in Val Marie, Saskatchewan at the junction of Hwy#4 and Centre Street. The staff is very knowledgeable, and will provide you with up to date information about the park. The park website is www.parkscanada.gc.ca/grasslands. And I almost forgot, the access to the park is currently FREE. After our visit we headed back to our camp at Cypress Hills Interprovincial Park. Great post! Don't forget to come back and check out Scotty after his new permanent exhibit gets set up in March! Thanks for the comment. We will.... maybe next fall.